The Downtown tour covers all the main highlights of Chicago’s Loop and River North districts. This Tour runs daily all year round and includes 12 different stops. 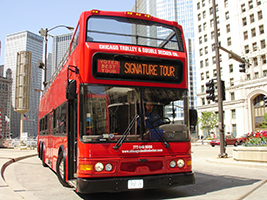 As we wind through a thirteen-mile tour route, customers have unlimited boarding access to the trolleys and double decker buses at any of the designated stops. Departure times are seasonal, but run approximately every 30 minutes. Free language app available for download on Android and iOS. Spanish, Mandarin, Portuguese and German. The Night Tour and Wrigley Field/Lincoln Park Zoo Route will be back in Spring 2019. You can redeem your voucher with an agent at one of the following stops: No.1, 3 or 8.